An exceptional finance offer from Hyundai will mean the highly acclaimed new Hyundai i10 could be yours for £99 per month - that's less than a meal for two at a posh restaurant! Maybe you have just passed your driving test and desperate to get your first set of wheels or perhaps are looking to downsize to a smaller car because of the tax and CO2 savings - either way Hyundai have made it more affordable. For example, a customer who buys a mid-range i10 1.1-litre petrol Comfort could pay a deposit of just £1,250 and a first one-off payment of £254. This would be followed by £99 a month for 35 months. The customer will then have the option to make a final payment of £2,993 to own the i10 outright - or they can hand it back to their dealer. Additional running costs are certain to be low too, as the i10 has an official average fuel consumption figure of 56.5mpg and sits in VED band B, meaning it qualifies for £35 a year road tax and under the current proposal will be exempt from the London congestion charge from 27th October. Insurance costs will be reasonable too, as all i10s sit in the lowly group 2E. Plus, for extra peace of mind, the i10 is covered by Hyundai's famous Five-Year Unlimited Mileage Warranty. Resale values are set to be the strongest in the class too, according to the independent industry value setters, CAP. The expert's New Car Data for March 2008 predicts that i10 future values based on three years and 60,000 miles will be an amazing 39% - higher than every benchmark rival including the Fiat Panda, the Citroen C1 and the Toyota Aygo. Guy Pigounakis, sales director of Hyundai Motor UK says: "With finance available from £99 month, we will be able to talk to an entirely new audience of potential customers, especially those younger purchasers for whom PCPs have become the 'norm' in recent years. The i10's exciting styling, outstanding dynamics and affordability will make it irresistible". The finance offer is available until the 30th May 2008. 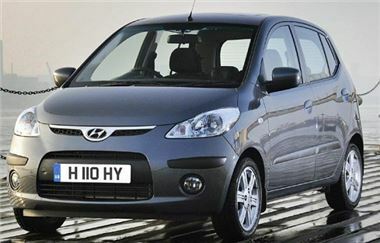 Further details and full terms and conditions can be found on www.hyundai.co.uk, by calling 0800 981 981, or from any Hyundai dealer.